This attractive and economical casserole dish was devised for the Irish Heart Foundation by Roland Lambe of Darndale Community Training Centre, Dublin 17. Chef’s Tip: If you find when cooking with a tomato based sauce that it is a little bitter, try adding some chunks of carrot during cooking, as it adds a natural sweetness. Alternatively roasted red peppers could be added at the end for extra flavour. Heat half the oil in a sauté pan with a lid. Add red onion and garlic and sweat for 5-6 minutes until softened but not coloured. Transfer to a bowl and set aside. Dust the lamb lightly in the plain flour and paprika, shaking off any excess. Return the pan to a high heat and add the remaining tablespoon of oil. Add the lamb and quickly sauté until lightly browned. You may have to do this in batches depending on the size of your pan. 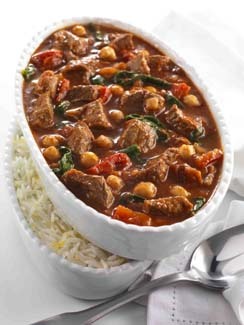 Stir the red onion and garlic mixture back into the sautéed lamb with the tomatoes and tomato puree. Pour in the stock and bring to the boil, then reduce the heat, cover with a lid and simmer gently for 1 hour until the lamb is tender but still holding its shape, stirring occasionally. About 5 minutes before the end stir in the chickpeas and allow to warm through, then season with a little salt and pepper. If sauce gets too thick, adjust with a little water. At the last minute fold in the spinach and continue to stir until just wilted. To serve: Baby boiled potatoes or roast potatoes seasoned with smoked paprika. Rice is also good with this recipe. Add zest of one lemon to the cooked rice for a refreshing twist.